Have you ever wondered how an airplane can fly through the sky? Or how an MP3 player has room to store all those songs? 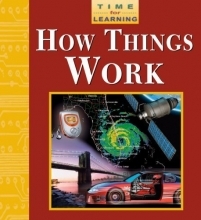 An adventure in discovery, Time for Learning: How Things Work explains the workings of these and many other machines and inventions, both high-tech and low. This exciting interactive book puts the adventure of learning right in your hands, with tabs to pull, wheels to spin, flaps to open, and more. Fill a submarine s ballasts with water. Bring a cartoon to life. Light up a fireworks display. Learning has never been so much fun!